Laryngoscopy: A procedure to look at the larynx (voice box) for abnormal areas. A mirror or a laryngoscope (a thin, tube-like instrument with a light and a lens for viewing) is inserted through the mouth to see the larynx. A special tool on the laryngoscope may be used to remove samples of tissue. Radiation therapy may work better in patients who have stopped smoking before beginning treatment. External radiation therapy to the thyroid or the pituitary gland may change the way the thyroid gland works. The doctor may test the thyroid gland before and after therapy to make sure it is working properly. Hyperfractionated radiation therapy and new types of radiation therapy are being studied in the treatment of laryngeal cancer. Chemoprevention is the use of drugs, vitamins, or other substances to reduce the risk of developing cancer or to reduce the risk cancer will recur (come back). The drug isotretinoin is being studied to prevent the development of a second cancer in patients who have had cancer of the head or neck. Check the list of NCI-supported cancer clinical trials that are now accepting patients with stage I laryngeal cancer. For more specific results, refine the search by using other search features, such as the location of the trial, the type of treatment, or the name of the drug. Talk with your doctor about clinical trials that may be right for you. General information about clinical trials is available from the NCI website. Supraglottic laryngectomy or total laryngectomy with or without radiation therapy. A clinical trial of chemoprevention. Check the list of NCI-supported cancer clinical trials that are now accepting patients with stage II laryngeal cancer. For more specific results, refine the search by using other search features, such as the location of the trial, the type of treatment, or the name of the drug. Talk with your doctor about clinical trials that may be right for you. General information about clinical trials is available from the NCI website. 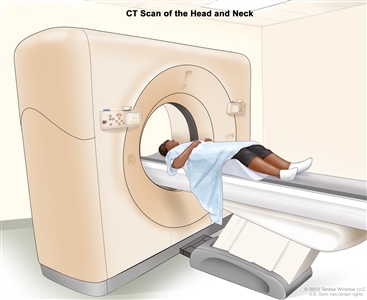 Radiation therapy for patients who cannot be treated with chemotherapy and surgery.For tumors that do not respond to radiation, total laryngectomy may be done. A clinical trial of chemotherapy, radiosensitizers, or radiation therapy. Check the list of NCI-supported cancer clinical trials that are now accepting patients with stage III laryngeal cancer. For more specific results, refine the search by using other search features, such as the location of the trial, the type of treatment, or the name of the drug. Talk with your doctor about clinical trials that may be right for you. General information about clinical trials is available from the NCI website. 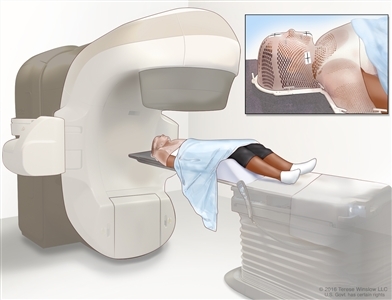 Radiation therapy for patients who cannot be treated with chemotherapy and surgery. For tumors that do not respond to radiation, total laryngectomy may be done. Laryngectomy plus total thyroidectomy and removal of lymph nodes in the throat, usually with radiation therapy. Check the list of NCI-supported cancer clinical trials that are now accepting patients with stage IV laryngeal cancer. For more specific results, refine the search by using other search features, such as the location of the trial, the type of treatment, or the name of the drug. Talk with your doctor about clinical trials that may be right for you. General information about clinical trials is available from the NCI website. 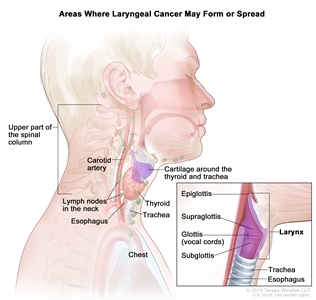 Check the list of NCI-supported cancer clinical trials that are now accepting patients with recurrent laryngeal cancer. For more specific results, refine the search by using other search features, such as the location of the trial, the type of treatment, or the name of the drug. Talk with your doctor about clinical trials that may be right for you. General information about clinical trials is available from the NCI website. This PDQ cancer information summary has current information about the treatment of laryngeal cancer. It is meant to inform and help patients, families, and caregivers. It does not give formal guidelines or recommendations for making decisions about health care.